Motorcyclists on the road have the same rights as individuals driving any other vehicle, and they are expected to follow all of the same laws under the California Vehicle Code, with some exceptions. 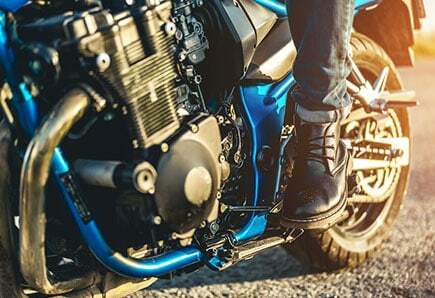 There are parts of the California Vehicle Code that pertain specifically to motorcycles, and it is important that you understand these motorcycle laws before hitting the road in California. Helmet Laws: In California, it is required that you wear a helmet at all times when riding a motorcycle, according to California Vehicle Code Section 27803. Headlight Laws: Any motorcycle that was manufactured after the year 1978 is required by law to operate headlights at all times, including during the daylight hours, according to California Vehicle Code Section 25650.5. It is also recommended that you improve the visibility of your headlight by using a modulating headlight. Visibility is vital when operating a motorcycle. Muffler Laws: Mufflers are required for all vehicles, and motorcycles are no exception. You cannot use bypass, cutouts or similar devices as per California Vehicle Code Section 27150. If you have a motorcycle that was manufactured before the year 1970, the noise level cannot exceed 92 dBa. For vehicles manufactured between 1970 and 1972, the noise level cannot exceed 88 dBa. For those manufactured between 1975 to 1985, the noise level cannot exceed 83 dBa. Finally, for vehicles manufactured after 1985, the maximum dba is 80 dBa. This is all according to California Vehicle Code sections 27201 and 27202. Radar Detector Laws: Use of radar jammers and laser jammers is restricted according to California Vehicle Code Section 28150. The use of radar detectors is not restricted according to the California Vehicle Code. These are not the only laws that you should be aware of as a motorcyclist, though they are some of the most pertinent when traveling on the roads of California. Our motorcycle legal team can help answer any questions you have about motorcycle law in California.